Thousands of years ago — below the earth's crust — turmoil, unrest, and massive pressure were building in what is now modern-day Southern Idaho. Kaboom! Lava exploded from the depths of Mordor... or maybe somewhere else. I have trouble remembering everything I read while visiting Craters of the Moon National Monument. What I can tell you for certain is that once the lava cooled, the land was left frosted in black rock creating an otherworldly landscape found nowhere else in North America! Take a break from earth while you check out these top reasons to visit Craters of the Moon. Sarah cuts a rug at Craters of the Moon National Monument. 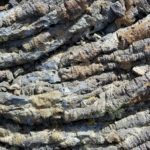 You’ll learn a rock load about geology! You’ll venture into lava tube caves. Fun Fact: NASA sent astronauts to Craters of the Moon to prepare for ... the moon. NASA also currently conducts simulations at Craters of the Moon in preparation for sending astronauts to Mars. You’ll stroll through Spatter Cones. Need a break from Earth? Though small, the visitor center is chalk-full of information about different types of lava formations found throughout Craters of the Moon. In no time, you’ll be pointing out Cinders, Block Lava, Pahoehoe, A’a and Bread Bombs. Does some of this sound like a different language? It is! 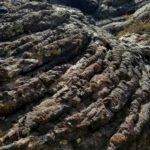 Many terms for lava flows and formations are Hawaiian words. 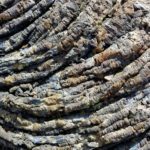 Pahoehoe (pa-hoy-hoy) comes from the Hawaiian word for “ropy”. As the surface of the lava cools and forms a crust, the hot lava flowing underneath pulls the top layer into ropes. Craters of the Moon is rife with these ropy ribbons. A’a (Ah-ah) is Hawaiian for “hard on the feet”. These lava flows have a rough and jagged surface that will chew your boots up and spit them back out. 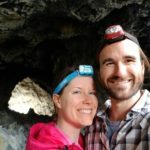 How many people do you know that have been inside a lava cave? Now you can say at least two! We went into all five lava caves throughout Craters of the Moon. You’ll need to obtain a free permit at the visitors center prior to entering the caves. Spoiler — it is issued in the form of a bat stamp. The first four caves are found along the Caves Trail. The fifth, Buffalo Cave, is accessed via the Broken Loop Top Trail. The parks service installed a metal stairway making this the easy to access out of all the caves. It is also the only cave in the park you can explore without a headlamp or flashlight. Multiple collapses in the tunnel's 30-foot high ceilings now let in ample light. The 800-foot tunnel requires scrambling up and over one of the rock piles left by a collapse. 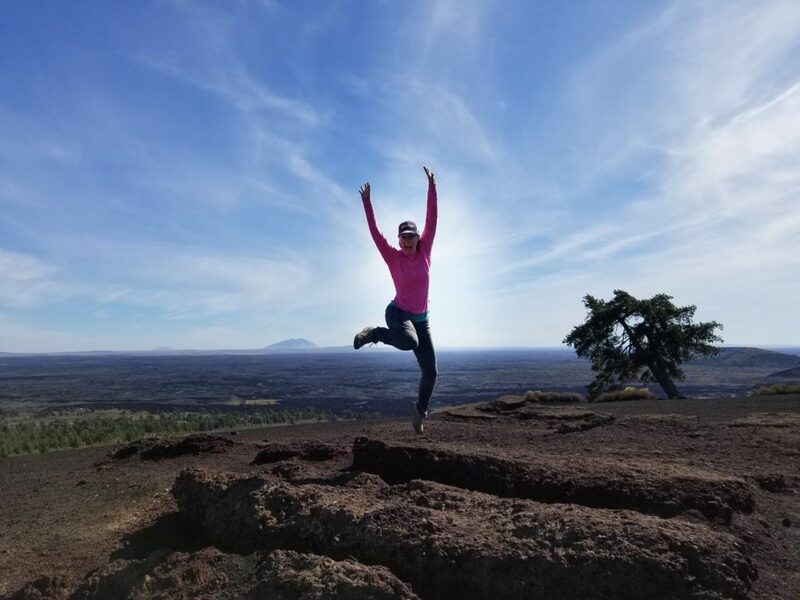 This is our top pick in Craters of the Moon! There are two sides to Boy Scout Cave, both of which have separate entrances and are a squeeze to enter. Entering to the left is easier and has higher ceilings once inside. Be careful — Boy Scout Cave retains ice all year long! Entering to the right, you go down a rabbit hole. Remember that tight squeeze in our video at the top of the page? This side of the cave is difficult, complex, and will remind you of your age. One-foot high ceilings in the middle segment require an army crawl. You will need a headlamp for both sides of the cave. Beauty Cave is easy to enter and walk through with its high ceilings and large opening. The cave is closed off part-way through due to unstable ceilings. If you are pressed for time, there is no need to walk down into Dew Drop Cave. Just about everything inside the cave can be seen from the walkway. 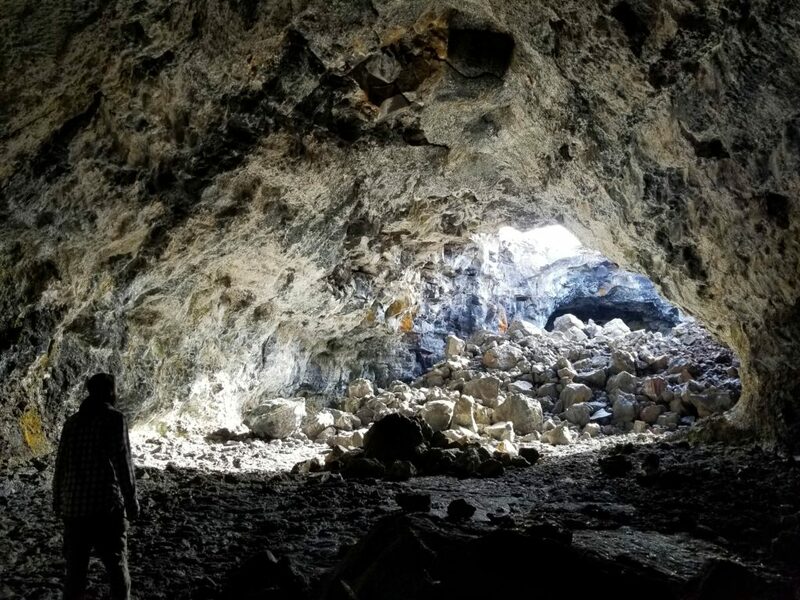 Buffalo Cave is accessed via the Broken Top Loop Trail (1.8 miles). We recommend doing the loop because it provides an opportunity to see A’a flows and Bread Bombs. If you want to go straight to the cave, start the trail counter-clockwise. Hiking up Inferno Cone is only one-mile round trip, but the path takes you straight up the cone. When you make it to the top, you’ll be rewarded with 360-degree views of the park. Once there, take a moment to think about how gaseous-filled lava was fountaining out of the ground right where your feet stand ... as recently as 2000 years ago! Spatter Cones are the remnants of miniature volcanoes that formed during the last gasp of an eruption. Craters of the Moon has plenty of them. There is a short accessible trail around several of the cones and it is certainly worth the stop. Craters of the Moon is an international dark sky park! But what does that mean? There is absolutely minimal light pollution. We watched a magnificent harvest moon rise over the lava fields. When the moon is not illuminating the sky, the milky way is clearly visible. Camping at Craters of the Moon is on a first-come, first-served basis. Get there early if you want a spot in the campground. 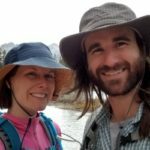 If you don’t luck out, there is an excellent KOA 18 miles away in Arco. Excellent, as in ice cream social every evening for a dollar per scoop and free waffles for breakfast. There is little to no shade in all of Craters of the Moon. We recommend SPF shirts and keeping a wide-brimmed hat with you. The top of Inferno Cone can be windy, the trails are without respite from the sun, and the caves are cool and damp. If you are going to be crawling through Boy Scout Cave, you will also want pants — and maybe knee pads if you’re feeling old like me. None of the scenic stops or trailheads have water available. There is a bottle-fill station at the visitor center. We recommend getting a Hydroflask. They will easily keep your beverage cold or hot for more than a day, making them great for all four seasons. 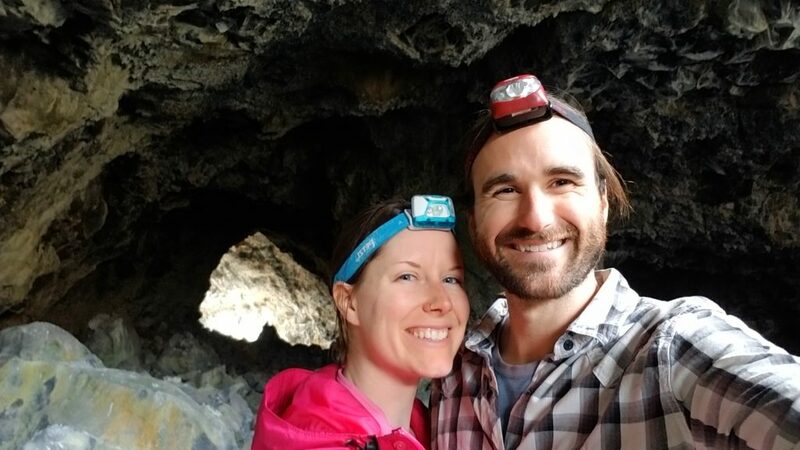 Exploring the lava caves are the highlight of visiting Craters of the Moon, and to do so, you need a headlamp or flashlight. Headlamps are preferable because squeezing through an opening and crawling in caves is much easier with both hands. Remember that A’a Lava we talked about above? Also, the caves are dark and damp, making them prime for stubbing toes in open-toe footwear. Here are my boots that are tried, tested and taking us around the world. Pin this for an out-of-this-world experience. Whoa! This does look like an out-of-the-world experience. Couldn’t have imagined that we could walk through lava caves and tunnels somewhere on the earth. This is definitely an interesting trip. 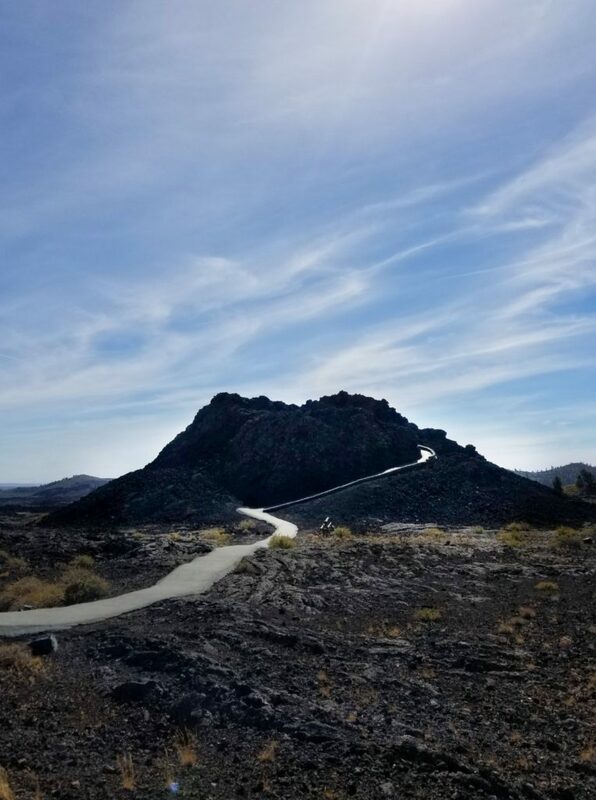 Craters of the Moon National Monument was such a unique experience that far exceeded all of my expectations. Gotta love our National Monuments! Lava, craters and rocks… Oh My! I’d love to go here. It sounds like fun and bet it was amazing in person. It was amazing in person! I hope you have an opportunity to visit sometime. So many lava caves and tunnels, woah! I didn’t know there was anything like Craters of the Moon National Monument. This is going on my bucket list. I didn’t know there was anything like this either. Sarah always looks up if there are any National Parks or Monuments in any state we are visiting. So glad she did! Looks like an interesting trip, also a bit of spelunking never hurt anybody right? If nothing else, a chance to learn about the earth, geology, and rocks is a fascinating thing. I wouldn’t mind giving it a try. I definitely recommend giving it a try! Craters of the Moon is currently my favorite National Monument we have visited. Haha from your very first paragraph, I could tell your post would be one with personality. It’s interesting to learn that the lava flows are from the Hawaiian language. I feel like everything I hear about usually comes from a Latin origin. Thanks Jojo! Boy Scout Cave was definitely the tightest cave I have ever been through! 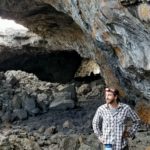 Lava tube caves look pretty awesome! 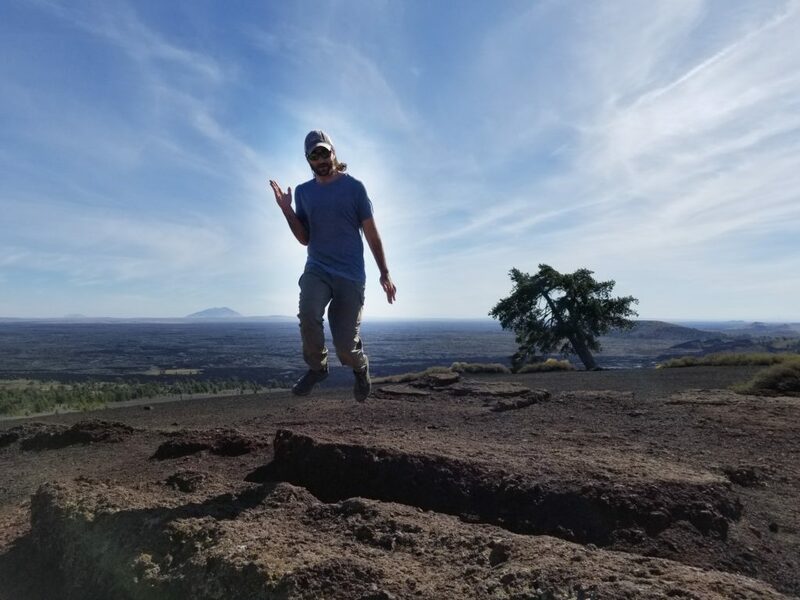 I’ve never heard of the Craters of the Moon National Monument so reading your post about it was really interesting for me. 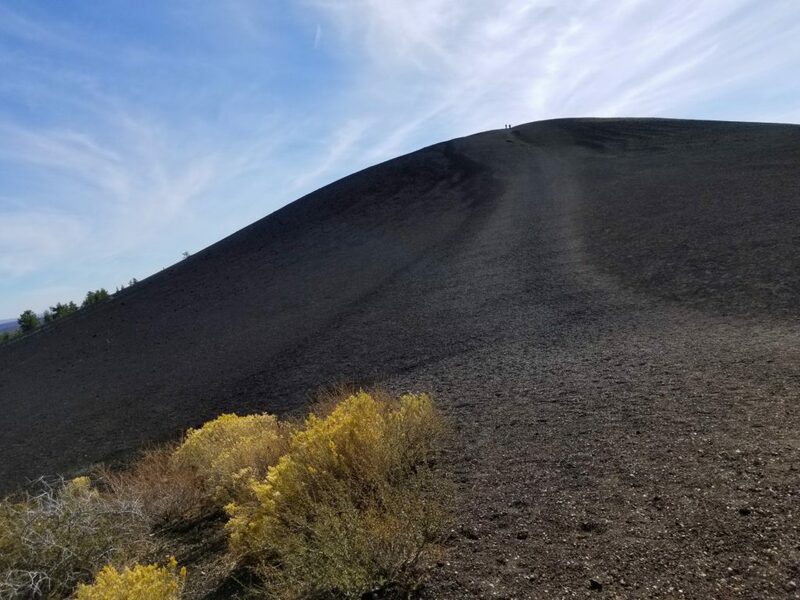 I’d also love to hike up Inferno Cone for lovely views of the park. The lava tube caves were certainly my favorite! Thanks for reading! Agh, these pictures spark emotions! It’s like from an outer world that makes me excited but thrilled. Definitely great tip for the visit! It was thrilling! Hope you get a chance to visit to someday. Kaboom! 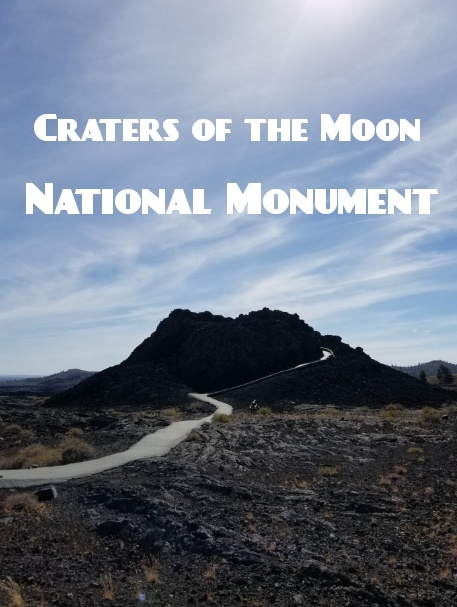 what a lovely weekend read this was 🙂 I had never heard of the Craters of the Moon National Monument before and it definitely sounds like a place not only my kids but I would enjoy visiting as well. I think kids would love to explore the caves! We saw many families in the park. Craters of the Moon sounds really exciting! Loved the fun fact that those going to the moon were taken here. I don’t know if I’ll ever actually visit it, but it was interesting to know it exists. I was extremely fascinated by NASA’s work in the park as well! Very interesting. Especially camping and shooting some astrophotography sounds very tempting. I’d love to do that. Craters of the Moon National Monument would be a great location for astrophotography. The Milky Way can be very vibrant here. This looks like a unique experience. Never knew such landscapes existed. Its such a wonderful place for photography especially Astro photography. Would love visiting it someday. Sounds like such an intriguing place and you had me at “NASA sent astronauts here to prepare for the moon landing”. Actually, that was what I was thinking about in the run up to you saying it. Would love to visit here some day – thanks for the inspo!